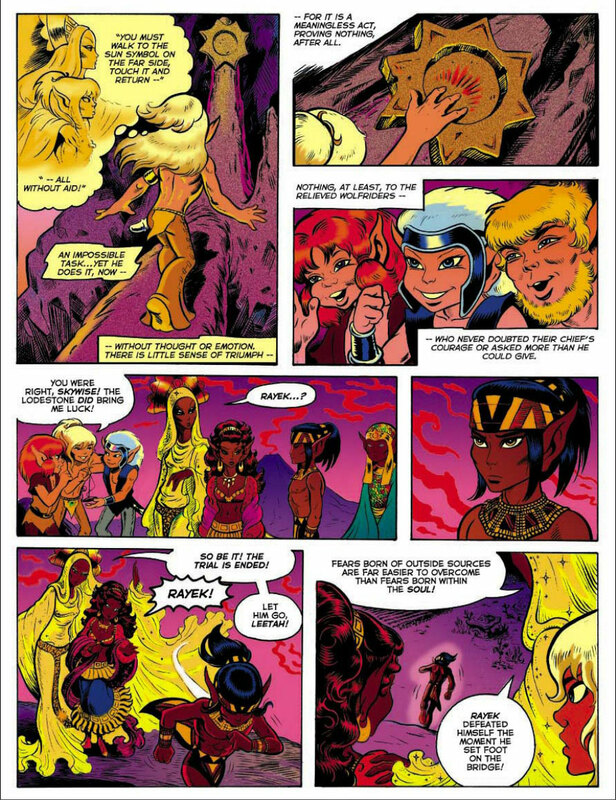 I read the original ElfQuest series back in high school. Early in the series, Cutter and Rayek are competing for Leetah's affections and she can't decide who to choose. The elder of the group, Savah, has the two take on a series of challenges to see which is more worthy. The final challenge for each elf to directly confront his greatest fear. Cutter's is a fear of heights and he is challenged to walk across a high, narrow bridge. And, while he's proven himself immensely brave in other ways, he initally crumples into a heap from terror. He rises to the challenge, though, and perserveres. As you can see, Rayek fails the challenge. His was a fear of loss. "He must be first... in all things... or he is nothing." It was a powerful sequence for me when I first read it, and Cutter's trembling "Never so far to fall!" has stuck with me. I was reminded again of the whole sequence this morning when I went out for a run. I was shooting for five miles, a distance that I haven't tried in about month thanks to the flu and moving. I was scared to head out because of the fear of my legs giving out or just running myself to exhaustion. But, fortunately, it started snowing. Not a heavy snow, just enough to let you know it was snowing. I recalled Savah's words and focused on conquering the weather. I forced my challenger to be the wind and snow, instead of my own potential inadequaces. The five miles didn't go any faster, but I made it a lot easier for myself than I thought it be.